A prospect this week asked us “what’s really the difference” between an optimized website and a non-optimized website. He figured it was a bunch of ‘cyber hype’. I explained the difference is between the two is actively promoting and just existing. A search engine optimized website is a virtual ambassador that promotes organizations 24/7/365. It works tirelessly without the need for breaks or benefits. And considering approximately 85% of all new traffic to websites arrive via search engines (namely Google), an optimized website is likely to be your most productive and valuable salesperson. Optimized websites are an asset to any business or organization. They are wise investments. Non-optimized websites, on the other hand, float aimlessly in cyber space. Some people might stumble on them via links from other websites. Or they might be pushed there by resource-intensive efforts, like passing out business cards or distributing marketing collateral at tradeshows. Non-optimized websites are primarily an expense. Businesses that invest in search engine optimization enjoy increased leads and sales within a couple of months, sometimes sooner. A new Mac consulting client reported website-generated leads within a week of uploading optimized content. 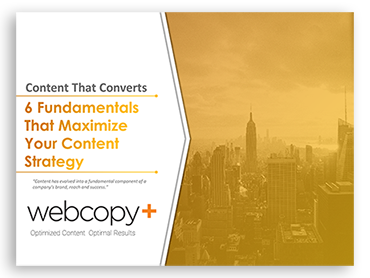 Indeed, properly optimized web content delivers a quick return on investment, which is especially helpful in these slowing economic times.